Interactive, engaging and entertaining, We Eat Bananas is a glorious exploration of the foods we love (and maybe don't love!). As you turn each page, a crowd of cheeky animals eat a variety of different foods: bananas, pancakes, sandwiches, ice cream, spaghetti, peas and more. They all eat in their own unique ways, adding the toppings and fillings they love, serving things up to suit their tastes. Questions prompt the reader to engage with the book: count the bananas, identify the vegetables, choose your favourite ice cream. And as you read the quirky characters’ comments, more prompts pop up, asking readers to search for different things and answer more questions. It’s loads of fun! Filled with bright and detailed illustrations by Katie Abey, this is a book to take your time with, explore the pages and uncover hidden jokes and hilarious pictures. Super entertaining, with a subtle message to eat lots of different foods (healthy stuff as well as treats! 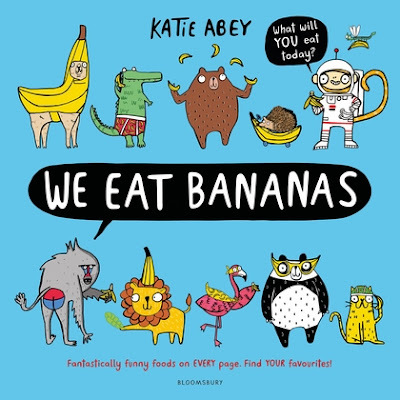 ), We Eat Bananas is a fun and foody read. And if the kids love this one, make sure you check out We Wear Pants, also by Katie Abey.